“Our homes don’t just contain our life earnings, they contain our memories and dreams; they stand for what we are. To destroy one’s home should be taken as an equal crime to destroying one’s soul.” Marwa al-Sabouni, The Battle for Home, Memoirs of a Syrian Architect. Recently, film footage emerged from Qaboun, a Damascus suburb that has seen fierce fighting between government forces and the Syrian opposition since the beginning of the war, including repeated airstrikes from the Syrian army. The film shows a city utterly devastated. Entire blocks are destroyed. Walls are missing from buildings; you can look inside to see staircases, exposed in their heart. Buildings have collapsed entirely, the streets are piled with rubble and satellite dishes, guardrails and building blocks. In my experience, when people speak about endangered cultural heritage, they don’t give much thought to places like Qaboun, with its concrete buildings and urban sprawl. Yet Qaboun was home to some 90,000 people before the war: it was where these people built their homes, had their gardens, raised their families. And among those concrete buildings were architectural gems: the Omari Mosque, from the Mamluk period, considered one of the oldest in Damascus; the al-Hassan mosque, also from the Mamluk period, and the Al-Sahba Abu Bakr al-Sedeiq Mosque, known as the Great Mosque. All three have been damaged or destroyed in the war. Qaboun is also one of the gateways to “Rif Damashq”—the Damascus countryside, famous for its trees and agriculture. The area’s most important heritage is its people, most of whom have been displaced because of the fighting. In Istanbul I sat down with Khaled, originally from Qaboun, and asked him about what mattered to him about the Qaboun he left behind. Here is his story about the beautiful trees in the fields outside of the city, and the house he built with his own hands. It has been slightly edited for clarity: I have used only his first name to protect his privacy. The best olive trees were from the area: olive trees and walnut trees. Of course the olive trees were very old, and from them we received oil as well as olives. In the summer we harvested zucchini and eggplant; they would take the tiniest eggplants and use them to make eggplant preserves. There were fig trees, a lot of fig trees, with many varieties: the black fig, the Malaki fig, the Sultani, the Hamari, and–don’t ask me why they called it that—there was a delicious fig called the Masoni fig. That was the best fig. 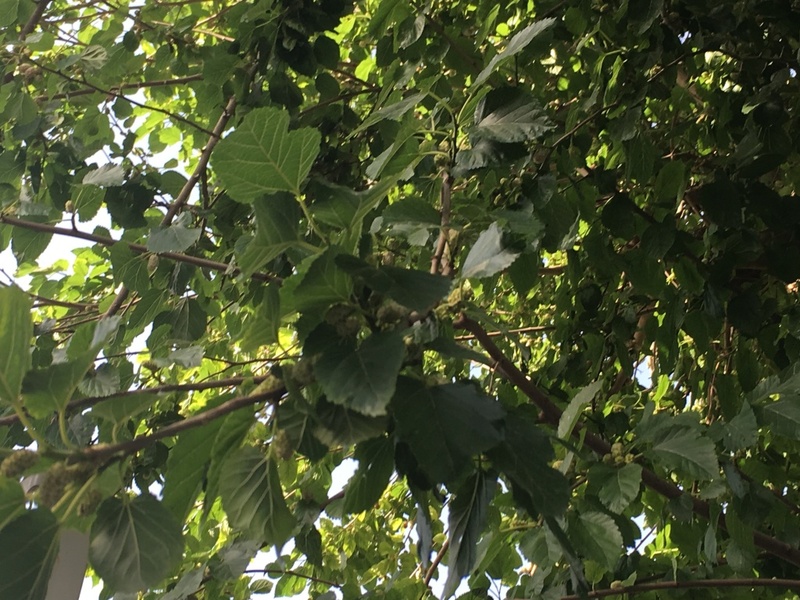 And there were mulberries– the normal mulberries, which we called “toot baladi,” and then toot shami. The minute you held toot shami, you would immediately have it all over your hands, but it was incredibly delicious. You could take it and press it through a cloth, then add water, and you would have mulberry juice—“aseer toot shami.” That tasted like paradise. The region of Qaboun was near two rivers: there was a river that went through the center, called the Yezid. It was a tributary of the Barada river, and at the end of the village there was a second tributary called the Tora. On the banks of that river, you could find zarour, or hawthorne trees. There were two kinds of apricots, mishmish hindi and mishmish baladi—and we made preserves from the mishmish baladi. There were peaches, and green plums that we ate with salt, and lots of pomegranites. We were known for our almond trees. We had melokhiyye, radishes, broad beans, red carrots, khubeizeh (mallow), grapes. There was a great deal of corn. We made preserves of eggplant, figs, and of course cherries. The most delicious cherries in all of Syria came from nearby Zabadani and Madaya. They were very small, and grew in the mountainous area. Nearby Douma was famous for its grapes. And of course we made makdous, the pickled eggplants stuffed with walnuts. We even grew saffron—it was extremely expensive, and we would use it to color the rice for the stuffed zucchini, mahshi. What else was there? There were so many things we were famous for planting: arugula, mint, parsley, rashad, chamomile, romaine lettuce. We had many places for making soap. Ours was a white soap, from olive oil. There was a hammam from the Ottoman times—we used to go to it when we were small, a hammam like the Turkish hammams. They continued to be used until around 1985, 1986, until they opened a new one, but I preferred the old one. It was beautiful because it was old. There was an old olive press, present until today. We would put the olives in it, and then an animal would circle around it to work the press, and the oil would descend into a jar. A horse or a camel would work there: whichever one happened to be around. I began building my house in 2009. I took land from my family, and then I decided to do it all the work by myself, without an architect. I was twenty-nine years old. First there was the house, by itself, and then there was a garden beside it: a simple garden with olive trees. Here, let me draw it for you: here’s the house, here’s the courtyard with tiles, here’s the trees. I did everything to protect the trees. The trees were pomegranate trees, fig, walnut, and one apricot tree—the white apricot. Then I planted grapes and mulberries. I planted the regular mulberries—the Damascus mulberries take too long to grow, and so we begin with the regular mulberries and have someone come and graft on the “toot shami” afterwards. I designed the decoration. I bought the furniture. Here’s the house, here’s a room, another room, the entrance, kitchen, bathroom; here’s the tiles, and here’s the garden. And a place with stones, and then olive trees. I worked on it for a year and a half, and had just put in all of the furniture. In 2011 (the beginning of the war) I went closer to Damascus to take care of my family, because our region was the region of the fighting. It was only last week that I received a video and saw what happened to my house. Everything was completely destroyed from airstrikes. They destroyed everything.